We had a great guide, itinerary, accommodations, and we had luck, all coming together to create the perfect safari. We saw lions, but not just lions.We saw lions in trees. We drove right under the famous tree-climbing lions of Lake Manyara National Park. We saw leopards. Once again, we were lucky. The leopard had cubs! We saw a cheetah with a kill, had elephants walk right past our vehicle, and watched a massive herd of wildebeest throw themselves from the riverbank and forge the river. We waited in the land cruiser, all of us buzzing with anticipation, as we watched lioness circling a buck she had already injured. We all knew the ending to this story but that changed nothing. The power and patience of the lioness was beautifully matched by the regal stubbornness of the buck. We moved on, aware that we would be passing by this way later that day. When we returned, the two were still locked in this dance neither willing to give in to the other. We were patient, we were in the right place, and we got lucky. All of this set in the breathtaking African Savanna. While on our Safari I learned many new bits of information on these many different varieties of gazelles, antelope, and birds, elephants, lions, leopards, cheetahs, as well as the gorgeous environment in which they live. I have condensed our two-week Safari into the best photos and the most interesting facts! The largest living creature that walks the globe is the Elephant. At the shoulder, they are 11 feet tall; they weigh approximately 6 tons and can be up to 24 feet long. 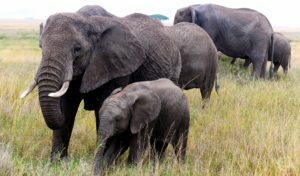 Female elephants carry their young for almost 2 years, and they will raise the calf for another 3 years prior to having another. Which means over the course of a female elephant’s lifetime, she can have up to 6 calves. Female and male elephants will grow tusks, they can grow up to 10 feet long. The largest tusk ever recorded weighed 214 pounds and was 11.5 feet long. Sadly, because of their incredible tusks elephants are hunted. Some regions of Africa have seen an 80% decrease in population since the 1980s. Over all elephant populations are on the decline. Loss of habitat, poaching, and a lengthy gestation period are all factors. Protecting these animals from poaching is a top priority for all of the parks that we visit, but poaching is still a major problem. If you want to know more about elephants and ivory, we recommend a recent documentary called The Ivory Game. There are 91 species of antelopes and gazelle, of which 72 are found in Africa. Antelopes are ungulates (they have even-toed hooves). All gazelles are antelopes, but not all antelopes are gazelles. The main difference between the two is found in their horns: gazelles typically have smaller horns than antelopes, and (generally) both male and female gazelles have horns. For example, only male impalas have horns. 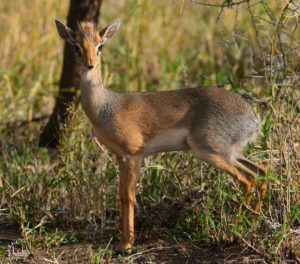 That’s why an impala is an antelope, but not a gazelle. 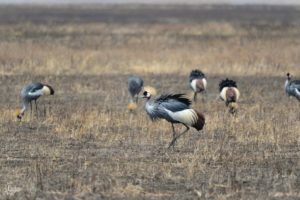 Tanzania is home to 1,100 species of birds. That is 10% of the species of birds in the world. Two weeks in Tanzania will result in sightings of roughly 300 of the 1,100 total species. Lions live in groups known as a Pride, which typically consist of one male and many females.The male does not hunt, nor does he contribute to raising the cubs. His primary contribution is reproduction, and the protection of his progeny. He maintains the Pride’s territory, fighting off any intruders, and giving the group the best possible size/location for their hunting grounds. Lioness will work together to take down prey significantly larger then they are. The World Wide Fund for Nature (WWF) states that lions sprint at 50 mph, and can jump up to 36 feet. Female lions will also work together to rear the young. 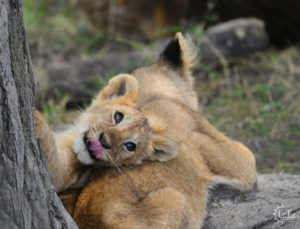 During the first 6 weeks of a cub’s life a lioness will keep them away from the group; after this, they are introduced to the pride where she, as well as all of the other females, will care for the cubs. They are the strongest climber of all the big cats; hunting and even eating high up in the trees. Dragging their prey up into the branches prevents their less agile competitors (lions and hyenas) from stealing it. 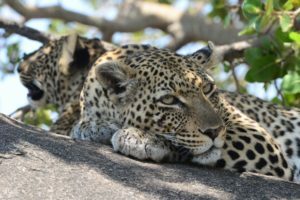 Leopard’s lofty vantage point can help them hunt but so does their coat. The spots act as camouflage. In addition, the spots can help us differentiate the various species, circular on East African leopards and square on the Southern African. their weight and flexible spine allow extremely sharp turning radius. Cheetah’s paws are unique among cats, their claws do not retract, and special pads increase traction. Most importantly their population size is dramatically declining. Although these animals rarely prey on local livestock they are hunted, on top of this, their habitat is shrinking. Only 7000 cheetahs are alive in the wild, 30% in less than 20 years. Giraffes and Zebras are known for spots and stripes, which always been associated with camouflage. Recently scientists discovered that the monochromatic patterning might also help with smaller carnivores—biting insects. 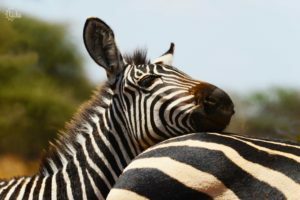 Much like a fingerprint, no two zebras are exactly alike; likewise, all giraffe’s spots are different. Zebras in the wild can live to be 30 years old. They will spend their lives in small familial groups, consisting of single male and his harem but they will gaze with other herd animals. 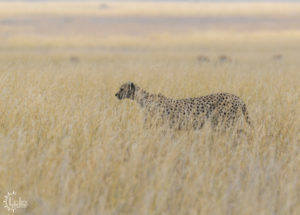 This gives added protection through an increased number of animals on the lookout and can also be confusing or add difficulties for predators to find an animal that they can single out. Giraffes are the world’s tallest mammals. Their feet are the size of an average plate, 12 inches in diameter. 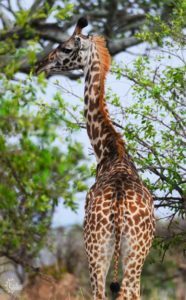 Predators are primarily an issue while a giraffe is young, or while bending down to drink. Their long tongue is purple to prevent them from being sunburnt and allows them to reach even higher for leaves. Our next safari leaves August 18, 2018, call or email to reserve your spot! Want to see more Photos? Click here to go to our Facebook page.